The AJAGen10 SD/HD/AES sync generator is as adaptable as it is inexpensive. Providing multi-format tri-level sync, colour black sync, 75% colour bar sync and AES tone or silence sync, the Gen10 supports up to 1080p and features seven outputs. These include two groups of independently controlled SD/HD sync outputs and one AES-11 output that alternates between silence and tone. The SD outputs are capable of switching between colour black or 75% colour bars while the HD outputs feature tri-level sync and can be changed between 19 diverse HD formats. All outputs are in sync with one another and are tracked from an exact master timebase. 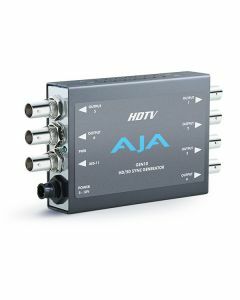 The AJA Gen10 is shipped with a universal power supply and universal plug connections for global compatibility, complete with a locking power connector to prevent accidental disconnection. Going international is made even more convenient by the AJA Gen10’s compact and portable design. It can fit behind a monitor, directly on a camera rig, in the back of a rack or in your back pocket.